Whether you are preparing for your wedding day, revving up for summer, or just want to convince yourself that its summer in January, knowing the perfect tanning lotion to buy is a vital part of the equation. 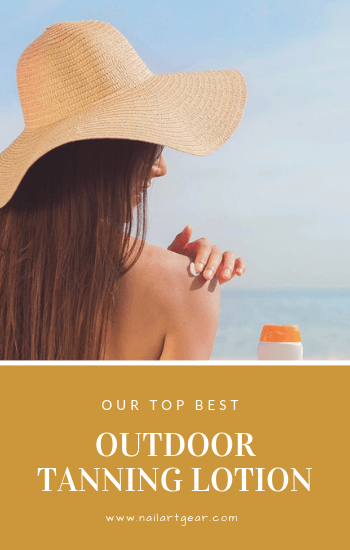 It is not easy to find the ideal outdoor tanning lotion- the one that will give you that beautiful bronze glow that we all want. This is exactly why we checked the top tanning lotion brands and found the best outdoor tanning lotion on the market. Take a look at these top picks to achieve the bronziest, and most even tan. Made from an old secret family formula, Maui Babe Browning Lotion gets you tan FAST. Rather than being a stain or a self-tanner, this product accelerates the sun’s natural tanning process within your skin. In just 15 minutes of sun exposure, you will be able to see a significant difference in your skin color. Even fair and very sensitive skin users are able to achieve desired tanning results by using this browning lotion. 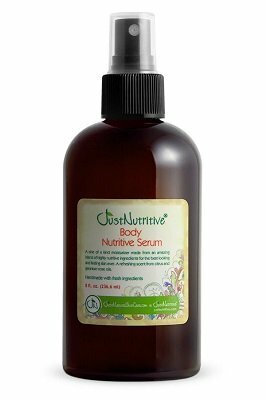 This product’s results come from an all natural formula, features ingredients of Light Mineral Oil, Kukui Nut Oil, Antioxidant Vitamins A, C, & E, Kona Coffee Plant Extract, Aloe and Potassium Iodide. No harsh stabilizers are needed for this formula’s five-year shelf life. Imported straight from the beaches of Maui, Hawaii, this tanning lotion smells like coffee beans with a hint of coconut. This comes from the ingredients of the Kona Coffee Plant Extract and the Kukui Nut and Mineral Oils. This product is a smash hit. Many pale people who typically can’t tan have had great results with this product. The ingredients are simple and effective, making users come back to purchase over and over. Sunscreen can be used with this product and applying a layer beneath Maui Babe’s lotion is recommended by many users. Otherwise, you may experience a sunburn. Also be sure to use a dark colored towel to avoid visible staining. 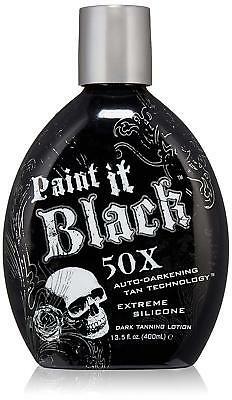 This dark tanning lotion claims an extreme dark tan bronzing effect. 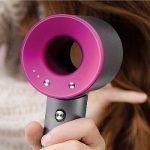 Its 50X darker technology will leave you with color payoff immediately, due to its bronzing pigments, and also accelerates your tan through sunlight or tanning bed use. Unlike many self-tanners, this one has a fresh cotton blossom scent to it. Most users love the scent, with one, in particular, saying it smells like pink lemonade to her. 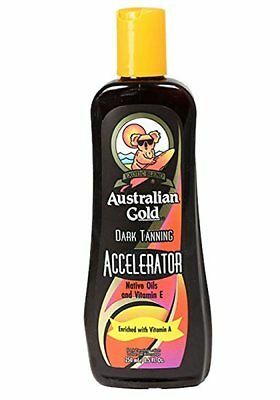 Millennium Tanning achieves a unique conditioning effect by including silicone in the formula, leaving your skin silky smooth as well as darker. This tanning lotion is formulated to have a firming effect on the skin. It contains vitamin A, vitamin E, vitamin C, and extracts of apple fruit, melon fruit, white birch bark, and banana fruit. The formula also features hemp seed oil, which is especially nourishing topically on the skin, and caffeine, which gives its firming effect. With this product, you will have no streaks, no stripes, and no stained hands after applying. Unlike the bronzing effect of many bronzing tanners, this one will not leave you looking orange after multiple days of use. Most users find this to be a home run product. It can take you from white as a ghost to a bronzed babe. Keep in mind though that the formula is not considered to be natural. With the aim of mentally sweeping you off to the tropics, this self-tanner darkens your skin by increasing the melanin production process. No bronzing agents are needed for its promised golden results. In addition to melanin formation, it is also packed with melanin synthesizers and tyrosine activity stimulators within the skin. Both allow for a long-lasting tan experience by getting the most out of your melanin producing ability. Certain ingredients in this formula help to reduce the appearance of cellulite and encourage firm skin. In addition, coconut oil, coconut milk, and cocoa butter combine to provide intense hydration, which is key to a long-lasting, even tan. 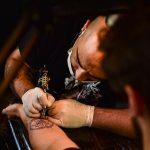 Worried about your tattoo being degraded by the sun? This formula helps to keep their life and radiance. With no bronzing agents, there is zero concern for an orange effect or fabric staining. The thick formula provides intense moisture to make your skin super soft. The scent is heavenly, though some people find it too intense after tanning bed use. For those with sensitive skin, this hypoallergenic formula may be your solution. Its vegan formula is very gentle, yet highly effective. This browning lotion provides moisture while accelerating the sun’s tanning effect. It is intended for outdoor use. With extra gentle ingredients, there’s no need to skip your desired tan due to discomfort. Whether you’re avoiding parabens, gluten or animal products, this is the formula for you. It contains many soothing ingredients like coconut oil, kukui nut oil, carrot seed oil, argan oil, and aloe vera leaf juice. Certified organic coconut oil, argan oil, kukui nut oil, marula oil, and avocado oil combine to provide intense moisture. It won’t leave you sticky, just incredibly soft. Are you ready for this? This one smells like chocolate. Heavenly chocolate. Or a chocolate scented chapstick according to one user. Either way, most people love the scent of this one. 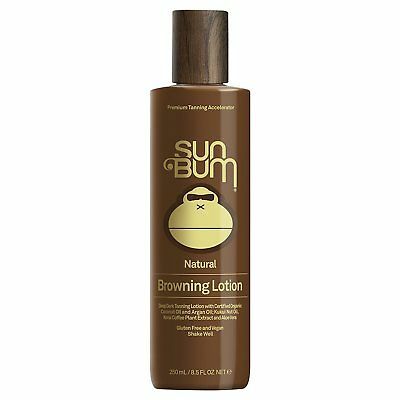 Sun Bum Browning Lotion leaves you with a wonderful brown color in just one application. The natural formula is a huge draw. Be sure to wear a sunscreen of at least SPF 15 before use to avoid potential sunburn and keep in mind that this product is not waterproof. Heavy sweating or a jump in the pool may leave streaks down the legs if they happen soon after application. 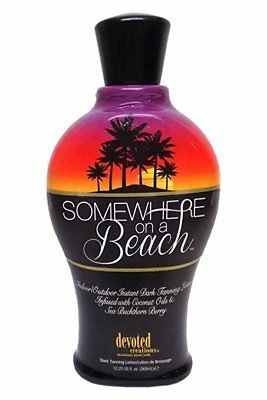 Known as one of the most widely sold indoor tanning lotions on the market, this tanning lotion lives up to its claims. It boasts that its blend of natural oils comes from plants and herbs only found in Australia. Even fair-skinned redheads have seen great results from using this product. The formula targets the skin’s ability to deepen via melanin production. 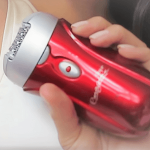 One of the unique perks of this product is how it counteracts the harmful impact of tanning on the skin. It does this through its trademarked Biosine complex as well as vitamins A and E.
This formula has thought of it all. It even prevents tanning related dehydration that can often happen with tanning lotions. This is due to its exotic natural oils and the inclusion of vitamins A and E.
This product has earned its spot as a top seller. It delivers fast results and smells of orange creamsicle. Even though its awards are for its indoor use, this product can be used to achieve desired results outdoors as well. Many people use this as a body lotion even when not tanning because they love the scent and moisturizing effects. Some people found their skin burned more with this product than other tanning lotions. Be mindful of this and monitor how long you stay in the sun. Rather than being a self-tanner or tanning lotion, this product is intended to be used in combination with your normal tanning routine. It does not contain bronzing agents or accelerate the melanin in your skin. Its purpose is to provide moisturized, healthy skin and to produce an excellent foundation for natural tanning. 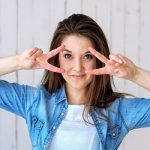 Unlike many of the other products on this list that increase melanin production or include bronzing agents, the Body Nutritive System keeps your skin moisturized as your spent time in the sun. If you tend to burn and peel, using this product will provide the needed moisture to prevent this process. Antioxidants powerfully smooth and protect the skin, causing visibility of wrinkles and redness. Some of the powerhouse ingredients include apricot kernel oil, kukui nut oil, and rice bran oil. This product is packed with skin replenishing ingredients including avocado, kukui nut, and peach kernel oils to make your skin soft and supple. Even its scent is all natural, using essential oils of geranium, grapefruit, and lavender. This formula is gentle and non-irritating. It has no artificial color or fragrance and can even be used on the face. In fact, many people have improved their facial skin appearance by using this on the face as well. Its job is to help provide a smooth base for your natural tanning routine. Keep in mind that if you don’t tan well naturally, then this product won’t give you the effects you are looking for. As the name suggests, this tanning lotion’s goal is to make you feel like you’re on a tropical beach any time of the year. It is both a melanin intensifier and bronzer that helps to achieve a deep tan effect without DHA in the ingredients. It can be used both indoors and outdoors. It has a trademarked BodyFit Technology to help firm in skin and mask the appearance of cellulite. One of the unique ways it does this is by having a BB Cream mixed in the formula to cover imperfections just as BB Cream face makeup does in face cosmetics. Peptides, vitamins and omega fatty acids help protect the skin against free radical damage and reduce the appearance of fine lines and wrinkles. These effects will amplify over time with continued use. Many people notice visible results in just two to three visits to the tanning beds when used indoors. It provides you with a beautiful bronze look rather than making you look orange. With bronzing agents in the formula, you will have the appearance of a deeper skin tone immediately. The results of this tanning lotion happen fast, and the smell is fantastic. No need to worry about streaks or staining with this product. Many users claim that it feels much more expensive than it actually is. However, if you already have a base tan, the bronzing aspect may not be dark enough for your liking. This tanning intensifier works by using melanin stimulants and melanin synthesizers for long-lasting results. Its dark golden results will have you feeling like a beachy dream. 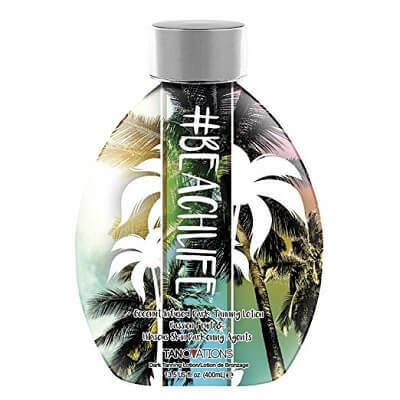 This #BeachLife tanning intensifier helps your skin in a way that’s different than most tanning lotions. It includes seaweed extracts in the formula that help to draw toxins out of the body. It is also rich in vitamins A and C by using Passion Fruit Extract. These help to protect the skin against free radical damage. Skin softeners of coconut milk and coconut oil help give your tan long lasting results. Hibiscus extract is also included to give the skin a youthful appearance. This ingredient also improves the skin’s elasticity, tone, and texture. #BeachLife also includes a trademarked BodyFit system to reduce the appearance of cellulite and promote firmness of the skin. 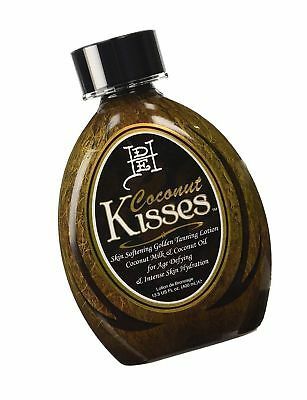 This product delivers great results, but not as quickly as some of the others because it does not include bronzing agents. As a bonus, it also helps to protect your tattoo’s color. The scent is very sweet and strong, which many users love. Some find the scent a bit too overpowering, though. This product is specifically designed to extend the life of your tan. It is a bronzing lotion built to hydrate and soothe the skin as you tan. This Pina Colada bronzing lotion can be used indoors or outdoors and it perfect to grab on your way out to a day in the sun. This product uses natural bronzers and erythrulose to get its bronze results. The formula itself is an off white color, meaning there’s no potential to stain your clothes or towels. This formula features aloe vera and matcha to hydrate and nurtures the skin as you tan. Aloe will help soothe your skin of any potential burning and matcha is a form of green tea that is high in antioxidants. Most people love the scent of this product. It has a tropical scent that reminds some users of coconut and vanilla. If you already have a dark tan color but want to go darker, this may be the one for you. It is DHA free, paraben free and gluten free. However, this product will take a little longer to build up a tan than a tanning lotion that contains pigmented bronzing agents. Many of the products here work very well, but none work as well as Maui Babe for your outdoor tanning needs. Made from a short list of natural ingredients, Maui Babe is packed with what’s needed to get great results and nothing more. You will see great results in just minutes instead of days or weeks. It will even help your skin become deeper if it is already tan in color, which is a downfall to many tanning lotion formulas. This product comes from a longstanding formula of Hawaiian ingredients that has given effective results for customers time and time again. How Can I Tan Faster and Darker Outside? To prepare, make sure to exfoliate your skin the night before tanning outdoors to remove dead skin to give you a canvas for an even tan. After, apply lotion to help the tan you achieve last a long time. Right before you start tanning, apply sunscreen. This will protect your skin and allow it to get darker over time rather than flaking off from sunburn. Next, use Maui Babe to stimulate the melanin in your skin. With this product, you will see results in minutes and will continue to build your tan to a deep color. After your tanning session, shower off. Rehydrate your skin by using lotion and drinking water. Repeat these steps as often as necessary to achieve your desired level of tan. Don’t spend more than a few hours in the sun. It won’t be until later in the day that you will see the results from your time in the sun. Can Tanning Bed Lotion Be Used Outside? Some tanning bed lotions can be used outside. Keep in mind that tanning bed lotions do not have sunscreen protection in the ingredients. Also, tanning bed lotions are designed to work with the UVA rays tanning beds use rather than both UVA and UVB rays of sunshine. If you use a tanning bed lotion outdoors, be sure to wear sunscreen. 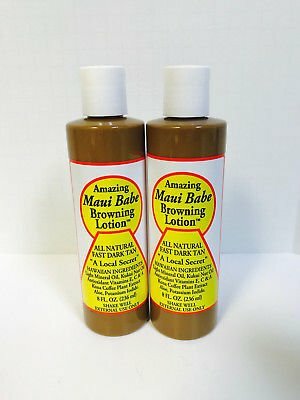 Is Maui Babe Browning Lotion Safe? Even fair and sensitive skin have desired results from using this product. One of the main ingredients in this formula is aloe, which helps protect the skin from burns it may endure. If you are a beginner at tanning, limit your sun exposure to one hour or less. Also, Maui Babe’s formula contains just seven natural ingredients. No need to worry that your skin may potentially absorb something harmful like with formulas that contain stabilizers. Be sure to wear sunscreen before using Maui Babe Browning Lotion to protect against sunburns. Think about the sensitivity of your skin. Many tanners use irritating ingredients to give their product a longer shelf life. This may be parabens, gluten-containing ingredients, animal products or other harsh stabilizers. If you are looking to avoid these, make sure they are not in the tanning lotion you buy. Consider how deep of a bronze you would like to be. Some bronzers contain bronzing agents that give an instant deeper skin effect. This can help to give you your desired results as you build up your tan naturally. Some tanning lotions, like Maui Babe, are known for helping your already tanned skin tan even deeper, which is part of why it’s so popular on the islands of Hawaii. An outdoor formula such as this will help you be darker by utilizing both the UVA and UVB rays of the sun, as many indoor tanning lotions only work with UVA light of tanning beds. Tanning can be a harsh process on the skin. Aside from avoiding potential sunburns, staying in the sun is often very dehydrating. When your skin is dryer, it often peels, fakes or has dry patches. This can result in your tan not being able to deepen due to skin cell shedding or having “hot” spots of uneven pigment. Some formulas help to counteract this. They may include nourishing oils or anti-aging ingredients to work against the sun’s effects. This allows you to continue your tanning journey without concern for how it’s affecting your skin. Some of the ingredients that help with this are vitamins A and E, matcha or green teas that are high in antioxidants, and nourishing oils such as hemp or coconut. The scent of your outdoor tanning lotion will affect how you enjoy your overall experience. 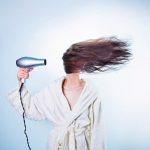 Many start out smelling like a tropical paradise, yet become overpowering or unpleasant after heating up with your body and spending time in the light. The scents come in a wide array from sweet smelling, to coconut scented, to citrusy. Some outdoor tanning lotions contain dark ingredients that may get on your clothing, bathing suit or towel. If you choose one of this kind, make sure to rub it in thoroughly and give it a minute to absorb before having it touch any fabrics. In some formulas, even this precaution is still not enough. Other formulas are off-white or colorless, which avoids this issue altogether. If your tanning lotion is dark in color, you may want to look to make sure it is waterproof. This will help to keep it in place. Otherwise, a quick dip in the pool or dripping sweat from your tanning session may cause the product to run down your legs in unflattering streaks. I hope you found our Best Outdoor Tanning Lotion Reviews article useful. Do you have any other questions about any other outdoor tanning lotion brand?